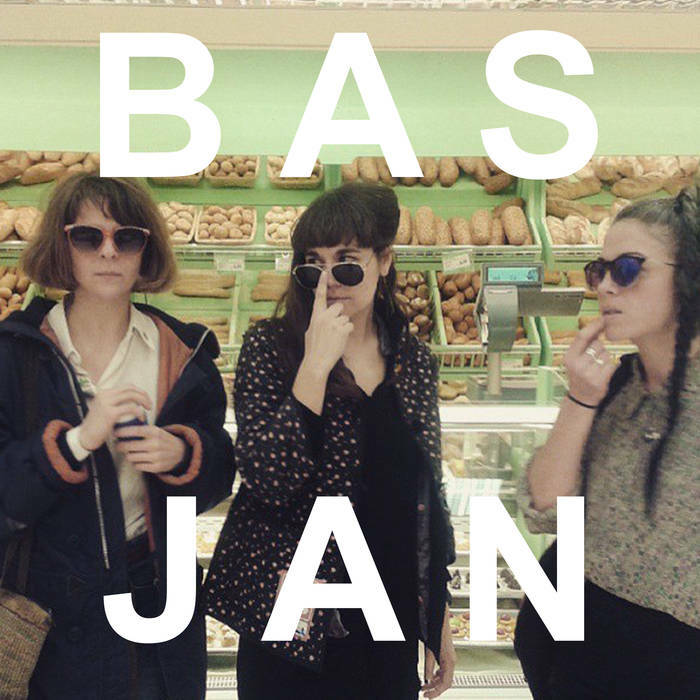 Experimental post-punk trio, Bas Jan have had a fair few guises. The compositional force of multi-instrumentalist, Serafina Steer meanwhile has remained a constant. Early offerings from the band appeared as Steer’s solo material until she began learning bass and writing with performance artist, Jenny Moore. The pair later recruited Sarah Anderson. Not long after she, Moore and Anderson parted ways for new ventures but like the phoenix rising from the ashes, Bas Jan mark ii was born. For such a fluid band, it seemed only fitting to welcome two deft musicians to its ranks; violinist, bassist and vocalist, Emma Smith and drummer and vocalist, Rachel Horwood (Trash Kit, Bamboo). Much as the band have been through a bit of a rebirth, album opener ‘Tide Me Over’ seeps in and hits the New Year nail on the head. We’ve all felt it. Slogging away for the past six weeks, “making a go of it”, hoping we can ride out of the darkness and into daylight savings time. The strings are a beacon on this album, tipping it from sterling to stand out. Contemporary violin references might throw up teen prodigy Vanessa Mae or, worse yet, virtuoso Nigel Kennedy, but fantastically theatrical ‘Argument’ glistens with fellow post-punkers, Raincoats’ ‘Fairytale…’ magic (a band who also share a classically trained violinist). Similarly, string-fuelled and frantic, ‘No Sign’ conjures up hyperlapsed imagery of Steer pounding the streets in search of a lost soul. A triumph for the musical Bechdel test. If we’re looking to the 70s trailblazers, there are some radical Slits nods in here as well. Not in the punk tunings, it’s not as transparent as that, but the reggae drawl of Ari Up. In relatable ‘Dreams of You’, Steer sees a former flame at a party and finds herself tracing their movements only to receive the shudder-inducing-Grandma-greeting: “You look so well”. Continuing the astute observations, quintessentially British, ‘Walton-On-The-Naze’ (not least for that seaside destination choice) isn’t a far cry from that time funk fivesome, Metronomy were pushing the English Riviera. It’s observational satire with the storytelling snark of Courtney Barnett: “There’s still a gherkin in the fridge, in a paper bag, we couldn’t finish it, from the fish and chip shop”. Much like their namesake, Dutch conceptual artist Bas Jan Ader, Yes I Jan fuses together vivid recollections. From the ceramic veins of the sink in ‘Corner of the Studio’ to the wonky adventuring and abandonment in ‘Sat Nav’ (with some serious screeching 80s guitars), these vivid memories are now ours as well. Because whilst the original Ader hasn’t been seen since he set out across the Atlantic Ocean in 1975 on his hunt to find the miraculous, Bas Jan have unearthed it in the humdrum moments of everyday life. And we should all try it, snatching a few seconds out of our daily lives to reflect, regroup and say “Yes I Jan”.